New for the 2013-14 season, the National Hockey League performed a major realignment of the conferences, divisions, and how the playoffs work. Both conferences have been slightly modified, mostly for the benefit of the teams. The Western Conference gained the Winnipeg Jets, making the Jets travelling much easier. In the Eastern Conference, they were thrown all over the place, where now in the Western Conference, the distance to all the other teams is significantly shorter. The Eastern Conference, in return, gained the Columbus Blue Jackets, and the Detroit Red Wings. As it was for the Jets, this shortens the amount of travelling that both teams have to do, for the teams they will be playing most often are closer in distance and time. As well, the Western Conference is usually tougher than the East, and the Red Wings and Blue Jackets are two great teams, so it helps to even them out. 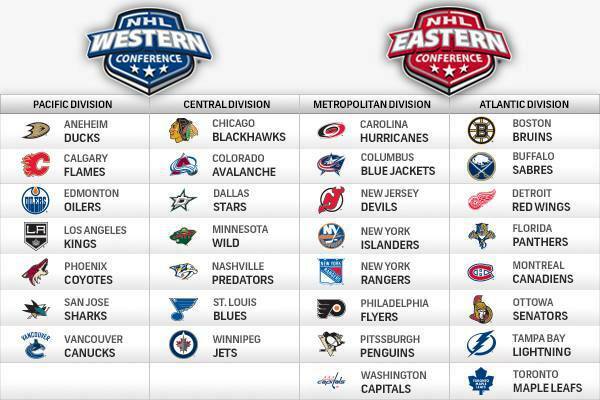 Along with a change in teams in each conference, there are new divisions. 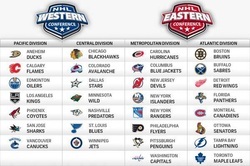 In the East, each division has eight teams, and in the West seven per division. There are now only two divisions per conference as well, in the East the Atlantic and Metropolitan, and in the West there's the Central and the Pacific. The Atlantic covers mostly the shoreline of the Atlantic Ocean to the north and south, with the exception of Detroit. The Metropolitan therefor covers the central part. In the West, the Pacific Division covers all teams relatively close to the shoreline of the Pacific Ocean, and the Central Division contains all teams more inbound and in the center of North America. The playoff configuration is rather confusing now after the realignment. Now, like American Football, Basketball, and Baseball, the NHL has a Wild Card in play. The top three teams in each division make the playoffs, and all the others are sent to the Wild Card. In the Wild Card, the top two teams out of all teams that did not make the top three for their division verse each other in the first round of the playoffs. Then the first place team for each division competes with the third place team in that division, and both second place teams play against each other. They still play in the traditional best of seven series.